Why See The Greatest Love of All - Whitney Houston Tribute? Led by South African star Belinda Davids, The Greatest Love of All Whitney Houston Tribute honors the late and great singer with mesmerizing performances of all her biggest hits. The eleven night tour will showcase just how unforgettable Houstons music is and how it will live on forever. The shows star Belinda Davids has always idolized Houston while honing in her craft as an exceptional singer. In the UK, Davids gained notoriety for winning BBC show Even Better Than the Real Thing, where the worlds best tribute acts go head to head. She has been a session vocalist for a range of great artists including Keyshia Cole, Keri Hilson and The Temptations. With a 6 piece live band and flawless dancers, this Whitney Houston tribute creates a powerful presentation of the highs of her life and the amazing musical legacy that she has left behind. Sound good to you? Share this page on social media and let your friends know about The Greatest Love of All - Whitney Houston Tribute at Keswick Theater. 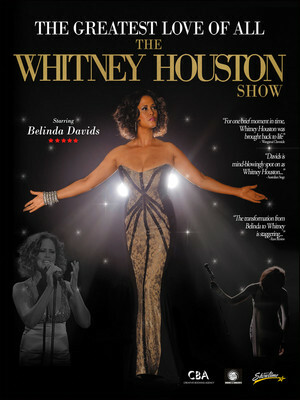 Please note: The term Keswick Theater and/or The Greatest Love of All - Whitney Houston Tribute as well as all associated graphics, logos, and/or other trademarks, tradenames or copyrights are the property of the Keswick Theater and/or The Greatest Love of All - Whitney Houston Tribute and are used herein for factual descriptive purposes only. We are in no way associated with or authorized by the Keswick Theater and/or The Greatest Love of All - Whitney Houston Tribute and neither that entity nor any of its affiliates have licensed or endorsed us to sell tickets, goods and or services in conjunction with their events.